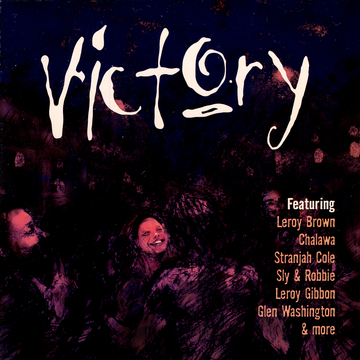 Backstage Productions International is very pleased to be presenting this fabulous collection of Reggae titles for such a worthy campaign – the support of Victory over Violence. The Victory CD features some of Reggae Music’s top artists including Sly & Robbie, Leroy Brown, Glen Washington, Stranjah Cole, Winston McAnuff and upstart Kenny “B” Blake. In assembling the CD we chose titles that we felt provide a message of hope, love, peace and compassion, while maintaining that up beat groove that is synonymous with Reggae Music. It was a real challenge to compile only 15 tracks from our extensive Reggae catalogue and we apologize for passing over so many of the other great recordings that are in our catalogue. Getting down to business, Trilogy Records will be donating a portion of the proceeds from the sale of every CD to a scholarship fund set up for today’s inner city youth, as a gesture of our support against the ever increasing violence we see in our cities, particularly gun violence. The scholarship fund will serve as a memorial in the names of those youth that have been killed as a result of gun violence. We are particularly proud to be working with Tropicana Community Services, a non-profit social service agency in Toronto, which was incorporated on March 26, 1980. Tropicana has demonstrated a tremendous commitment to youth since its incorporation and we are pleased to be associated with such an outstanding community organization and are confident that the spirit and message connected with the Victory CD will be heard and will surely have an impact. Thank you for listening and supporting this initiative. The legendary rock ‘n roller Ronnie Hawkins was literally halfway through a haircut at a downtown Toronto salon, in May of ’91, when a reporter was ushered in to direct questions at him. “Boy, that Steve sure doesn’t waste a minute,” The Hawk drawled. That resourceful time management was the work of Steve Thomson, Hawkins’ exclusive manager for the past 13 years. And it was emblematic of the diligence and dedication he has applied in that capacity, in maintaining – and in some respects raising – the Hawkins’ profile into the 1990’s. With an aggressive, courteous and thorough promotional and managerial manner, Steve Thomson, 41, has expended considerable energies over the past five years in building on Hawkins’ loyal European following. The results have included two extensive European tours, several stadium appearances at such events as the massive The Wall Concert (in Berlin, in 1990), and a distribution deal for Europe and Asia. On the home front, he has kept the veteran singer on a steady performance schedule; and has served as executive and artistic producer of his last four albums, among the best sellers in his 40-year career. And while this has represented his chief commitment since 1979, Thomson has some 30 years of experience in the music business and has forged a reputation as one of the elite, all-round managers in the Canadian entertainment industry. The Toronto, Ont. native got his start as bandleader and guitarist with the early 70’s group Fat Chance (which earned a contract with Capitol Records), before diversifying into management and at one point building up a roster of 15 artists. As President and Chief Executive Officer of the Toronto-based Backstage Productions International and Trilogy Entertainment Group since 1977, the always dapper Thomson has devoted himself to a wide variety of projects. He handles several other independent recording artists in addition to Hawkins, and has made significant progress in trailblazing international markets for their material; has kept a busy hand in promoting many national level, corporate-related events; and has been tireless in helping to develop the Canadian recording industry, serving as a director of CARAS (the JUNOS), and the Canadian Independent Record Production Association (CIRPA), as well as volunteering his time on many industry committees. The most recent and impressive example of Thomson’s entrepreneurial abilities and commitment to Canadian rock came through his involvement in the hugely successful “Canada Rocks Cannes” presentation, in January at the 26th annual MIDEM music festival held in Cannes, France. (MIDEM is the music industry equivalent to the Cannes Film Festival.) As producer, he single-handedly transformed the scope of Canada’s participation in this event from a guest appearance by Hawkins, into a full-scale international showcase featuring such artists as Rik Emmett, and The Box. That entailed intense negotiations with a number of different levels of government, right down to the booking of flights and hotels – all done on relatively short notice. “He is really quite remarkable. He put the whole thing together against great odds,” observed John Martin, Director of Music Programming for MuchMusic and City TV, which televised this breakthrough event. Such an international foray was nothing new to Thomson, who has made over 20 trips to Europe and the Far East in the past decade, displaying much foresight in the exploration of world markets. And this has borne fruit, with: the 1991 launching of the Trilogy Records label in Europe, Japan, Korea and Southeast Asia (with such artists as Hawkins, pop/dance singer Patti Jannetta, and country performers J.K. Gulley and Kimberley Richards); and the 1991 signing of hit Swedish hard rock band Bai Bang to Trilogy, and subsequent arrangement of a Japanese distribution deal with Zero Corporation, distributed by Toshiba/EMI. Thomson has shown a keen marketing sense in many areas. In 1990, he negotiated the first ever blue chip sponsorship of a Canadian recording artist, when Warner Lambert lent the CERTS name to the promotion and tour of the Jannetta album “Breathless”; and he worked on the successful (1990) Crispy Crunch “Taste The Music” campaign, including the cassette, contest prizes, and nationwide distribution through Sam The Record Man. Indeed, Backstage/Trilogy ranks as one of the country’s leading, all-purpose entertainment agencies, with an impressive list of corporate clients, which includes such majors as Molson Breweries, Tyson Food Corporation, Hamilton Tiger-Cats, and Eventure International Events Management, in London, England, and Hudson Bay Company. Thomson has produced many major shows across Canada including events for Speedorama and has helped coordinate the annual New Year’s Eve celebration at Nathan Phillips’ Square, since its inception in 1985. He arranges all the entertainment for Regent Holiday Cruise Lines, and routinely stages concerts at such top Canadian venues as LuLu’s in Kitchener, and at fairs and exhibitions from coast to coast. Over the years he has presented shows featuring dozens of stars including Kim Mitchell, Murray McLaughlan, Elvira, LaToya Jackson, and George Thorogood. His depth of experience as both musician and manager has given Thomson a rare and comprehensive understanding of the recording industry. And over the years, he has consistently liaised with governmental agencies, TV and radio stations, multinational corporations, major record labels, and the entertainers themselves. And while he works without the benefit of a major label distribution deal for Trilogy, and no gold records hang from his office walls, he has demonstrated an unflagging commitment to creating new avenues for Canadian recording artists. In early 1991, he did virtually all the legwork in the release of “The Best Of Canadian Rock” compilation (on PolyTel Records), which features 36 classic Canadian hits from the 70’s through the 90’s, and has served as a fundraiser for the Canadian Independent Record Production Association. “I really want to develop the recording and music publishing ends of the business, so it’s international,” Thomson commented.